Logically organized, this book guides readers through all aspects of vibration analysis. Each chapter explains how to harness the problem-solving capabilities of today's popular engineering software, including Mathcad, Maple, Matlab, and Mathematica. Topics covered include vibration measurement, finite element analysis, and eigenvalue determination. Included are more than 300 solved problems--completely explained. This Schaum's outline is a better reference and source of examples and problems than it is a stand-alone tutorial. 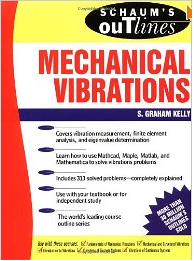 It does a pretty good job of outlining the material and kinds of problems you need to solve in a course on mechanical vibrations, but the explanations fall somewhat short. Also, remember that to understand this material you should already be familiar with matrix algebra, calculus, and both partial and differential equations, as well as your engineering mechanics.